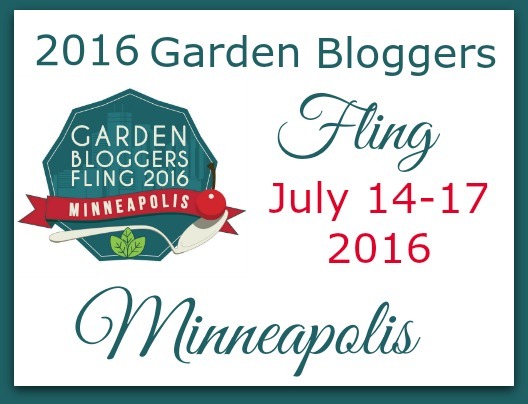 A few weeks ago we joined a group of garden bloggers for the annual Garden Bloggers Fling. This was my third trip and Shawn’s second. It was just as amazing and fun as the others. This year I mostly used my phone to take pictures and Shawn used the good camera. 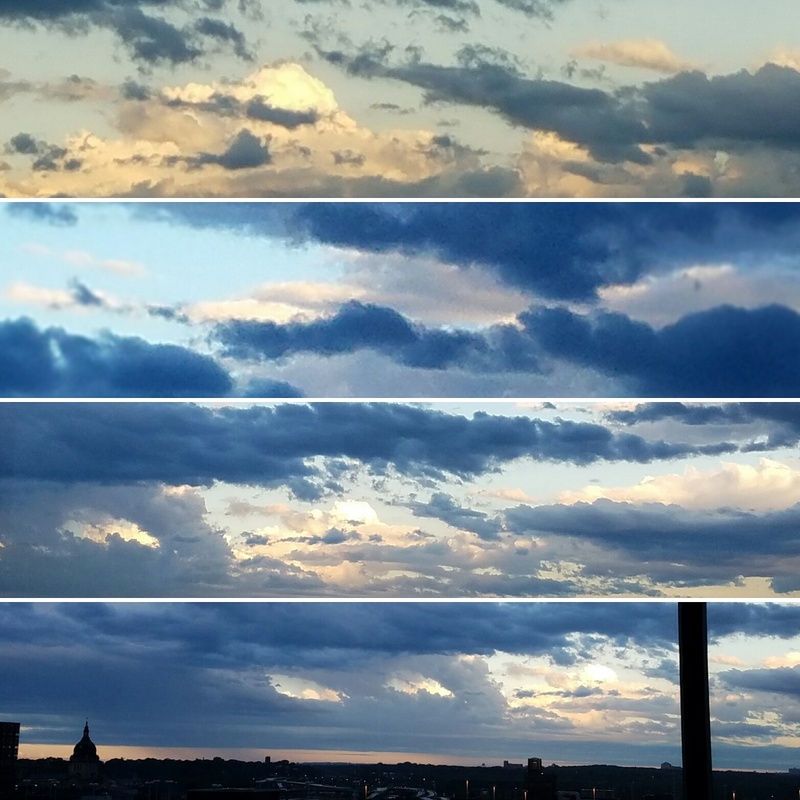 I had fun making picture collages and uploading them, tagging the location, as we left each destination to Instagram. The event started Thursday evening at the Minneapolis Central Library. 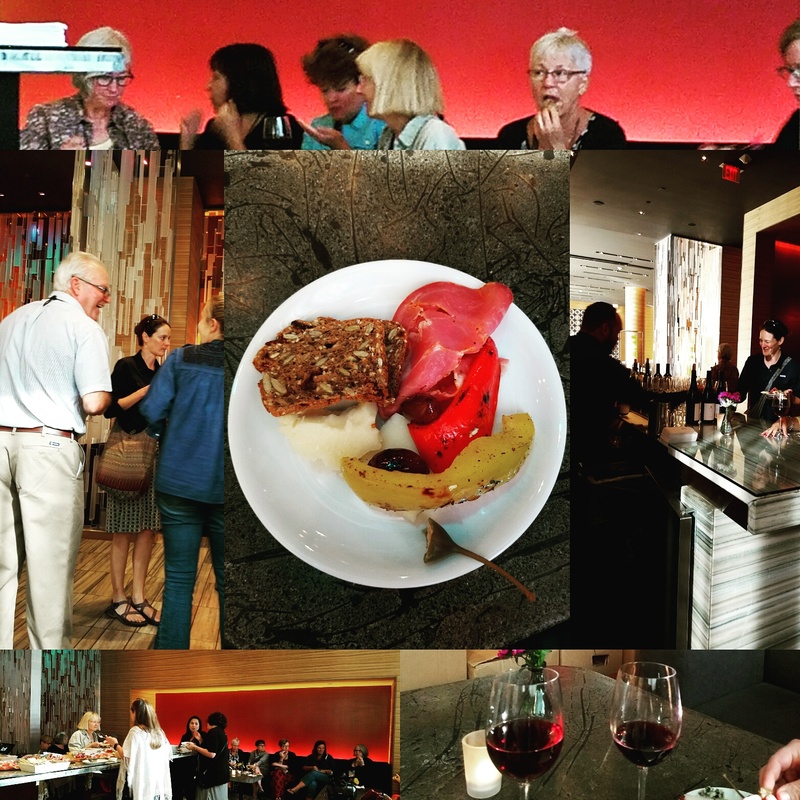 It was a chance to greet friends we made last year and meet newbies while sharing nibbles and drinks. The library is new and our room had a wonderful view. Not as good as the view from our hotel room however. This is sunrise over Minneapolis from the Loews Hotel! 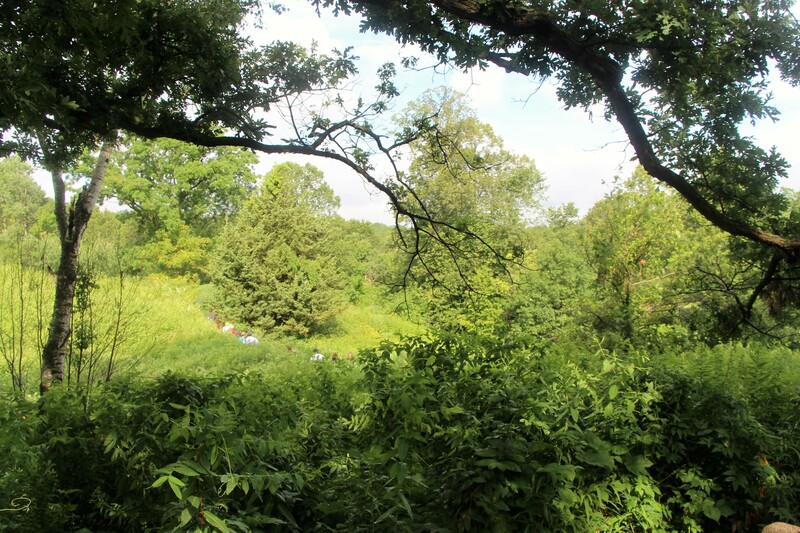 We started the garden tours Friday morning at the Eloise Butler Wildflower Garden and Bird Sanctuary. 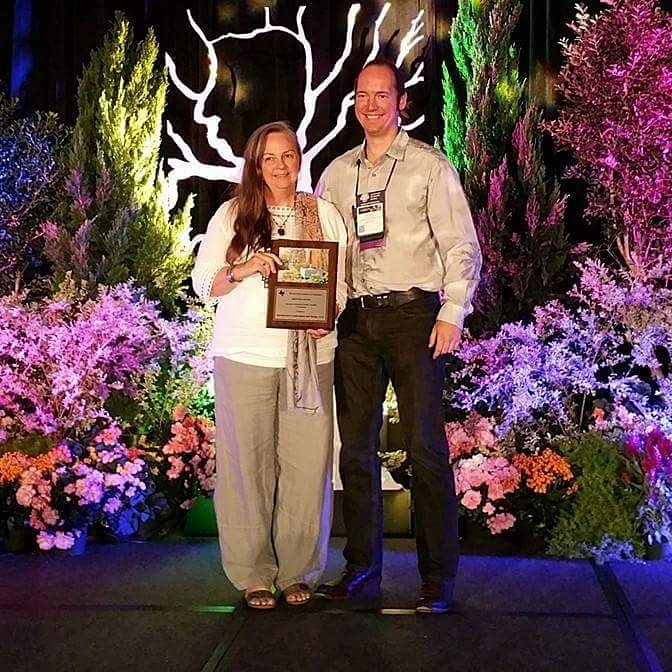 Ms. Butler was a teacher and pioneering horticulturalist. She established the garden in 1907. 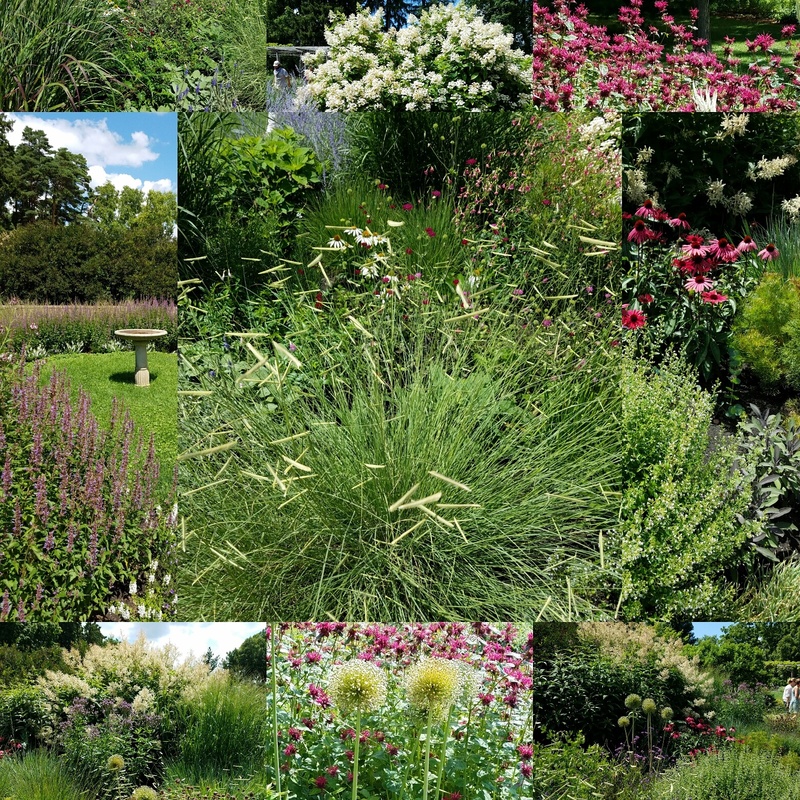 It is the oldest native-plant garden in the United States. It was the perfect place to start our tour. 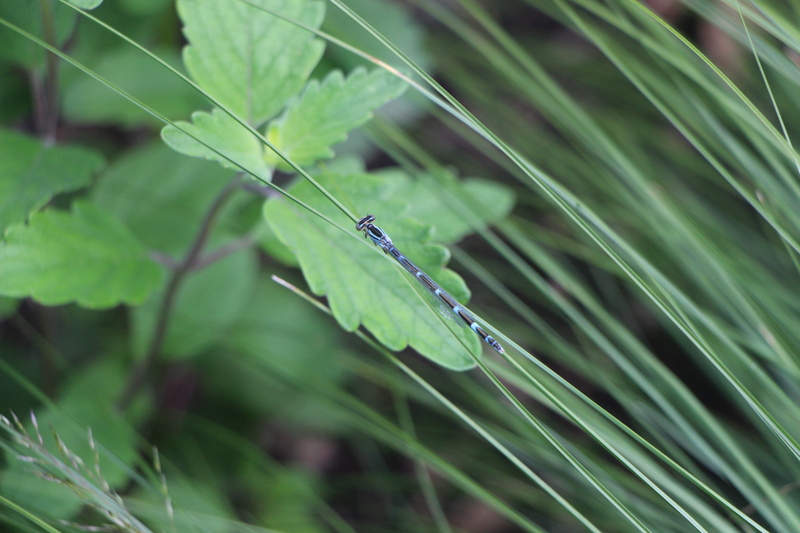 It was refreshing to be out in nature, breathing in fresh air and surrounded by native plants. We broke up into smaller groups. 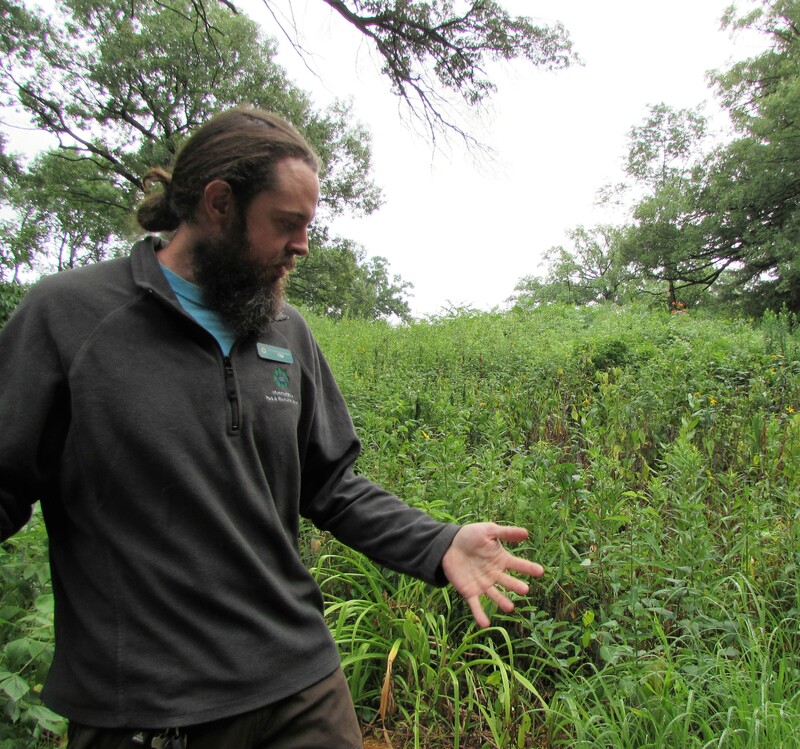 Our tour guide Tim was one of the gardeners who’s job is to keep out invasive plants. Shawn went with another group that was on the fast track and saw more of the garden. Here they are going up one of the many trails through the meadow. Wildflowers are so delicate and fun to happen upon in the lush green meadow. 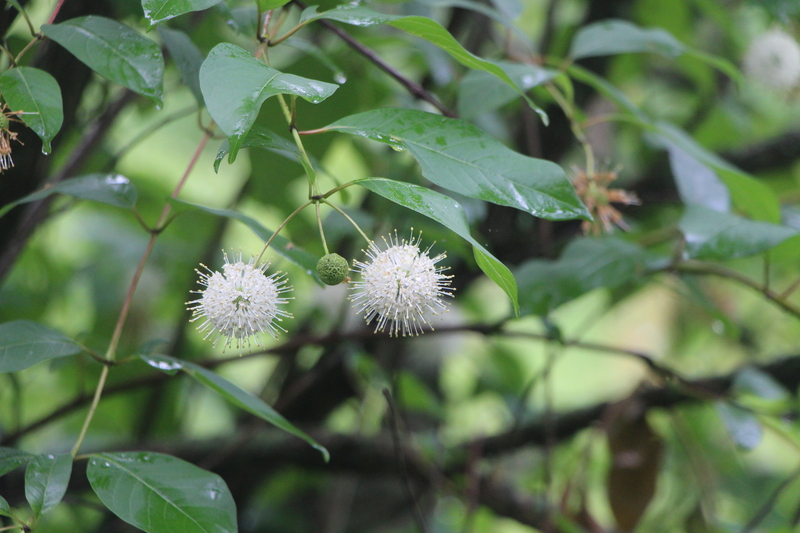 I love Button Bush Cephalanthus occidentalis. 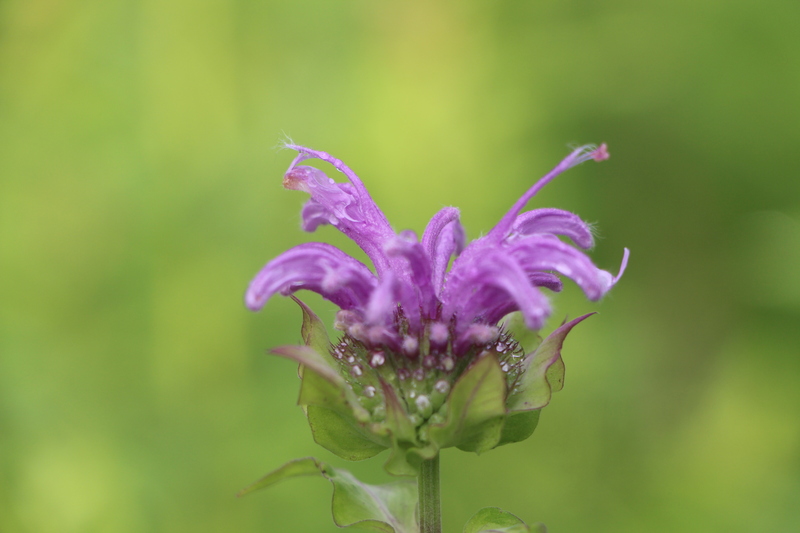 Monarda fistulosa aka Bee Balm or Wild Bergamot. 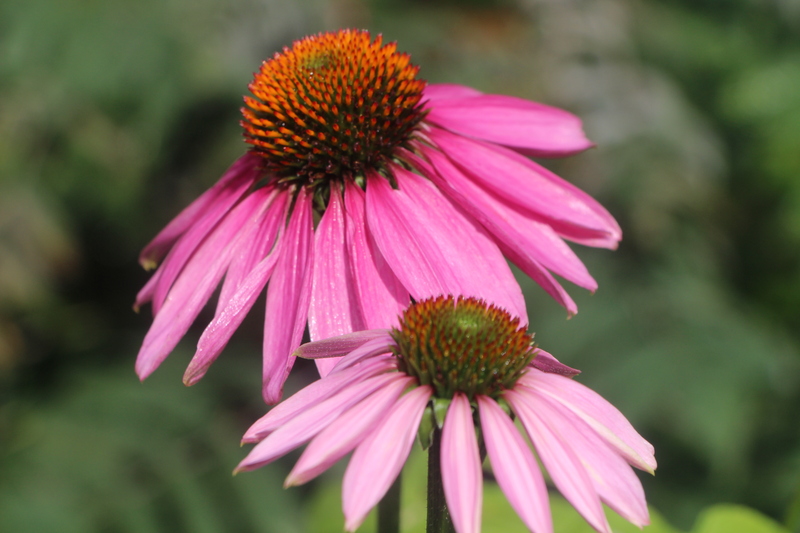 Purple Coneflower Echinacea pallida Flowers weren’t the only beautiful things to photograph. 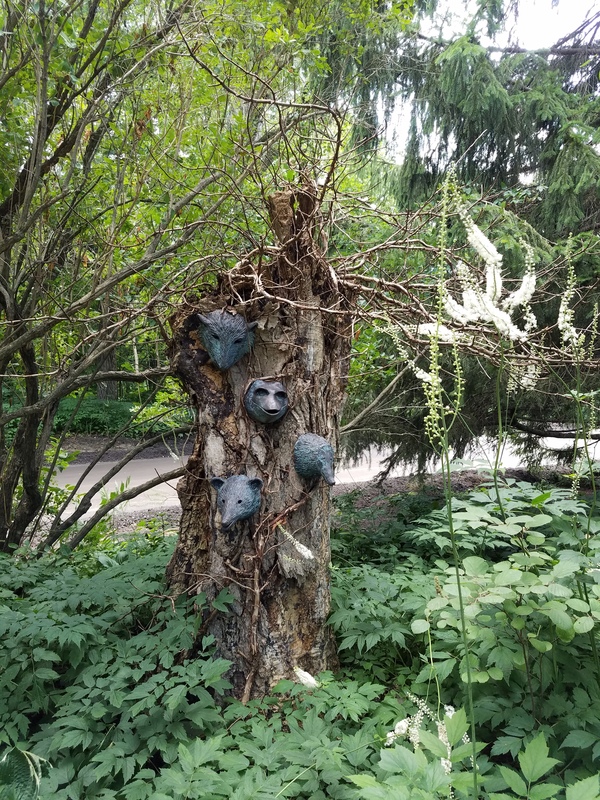 Next we headed to the Studio Garden of the artist Donna Hamilton. 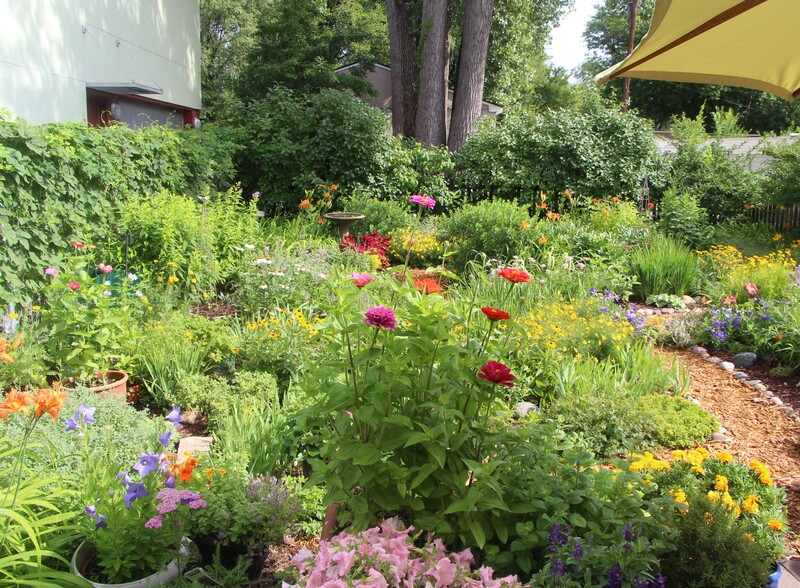 She turned an old grocery store in to a studio and designed a beautiful garden behind it. 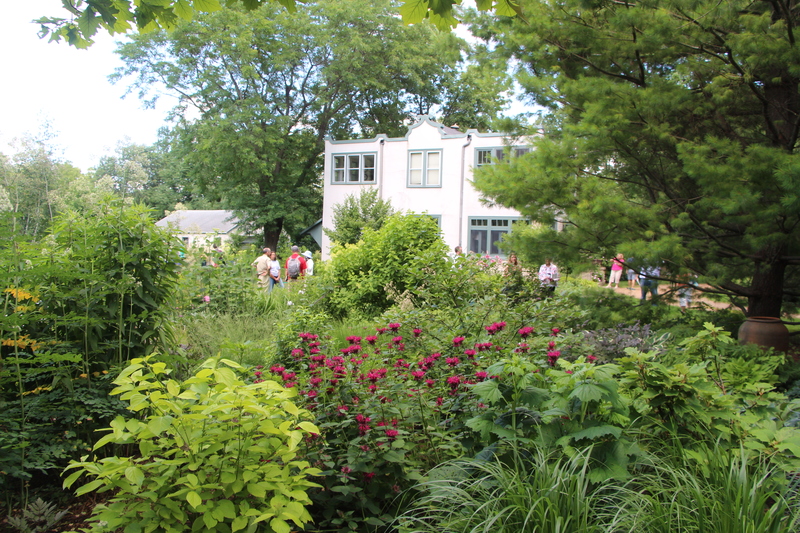 Our group of 60 plus garden writers and photographers left little room in the garden. 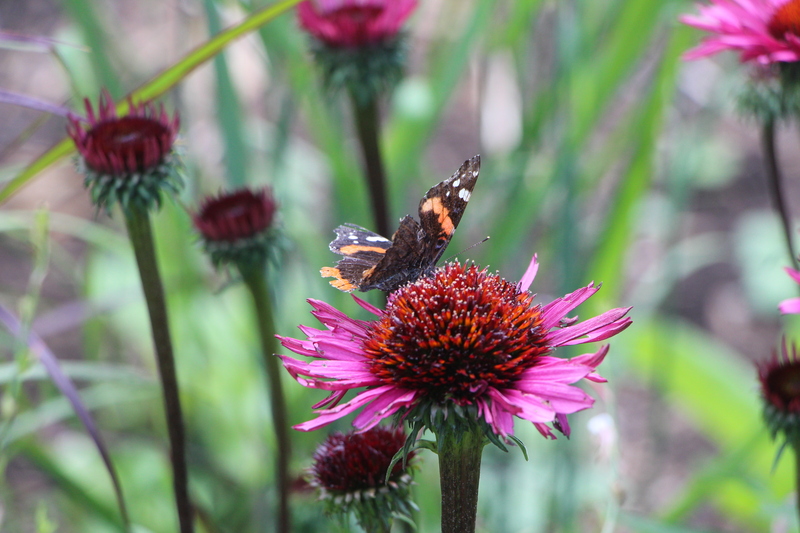 Shawn’s photo gives you and idea of this colorful garden full of flowers, bees and butterflies. Fitting in as many gardens as possible we don’t stay long at most. But enough to see how lovely gardens are in this part of the world. 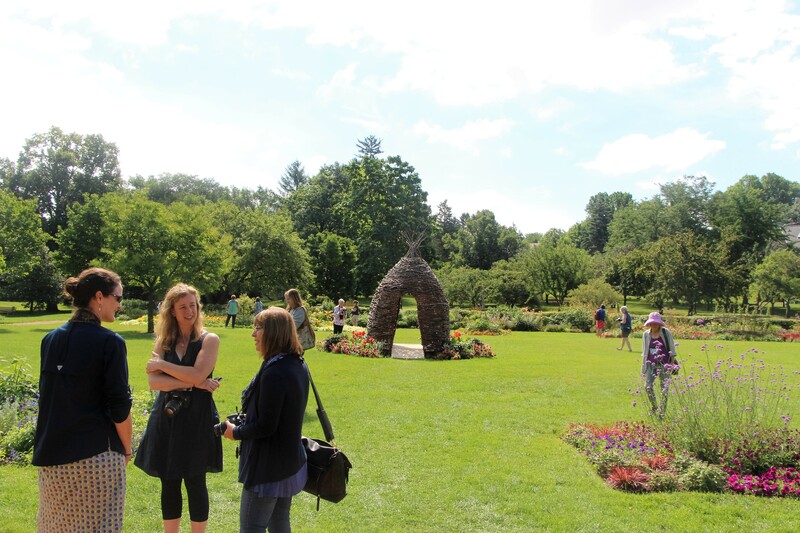 Our next stop was Lyndale Park Gardens shores of Lake Harriet. First we headed to the Japanese style Garden. Across the street is a rose garden and perennial garden. 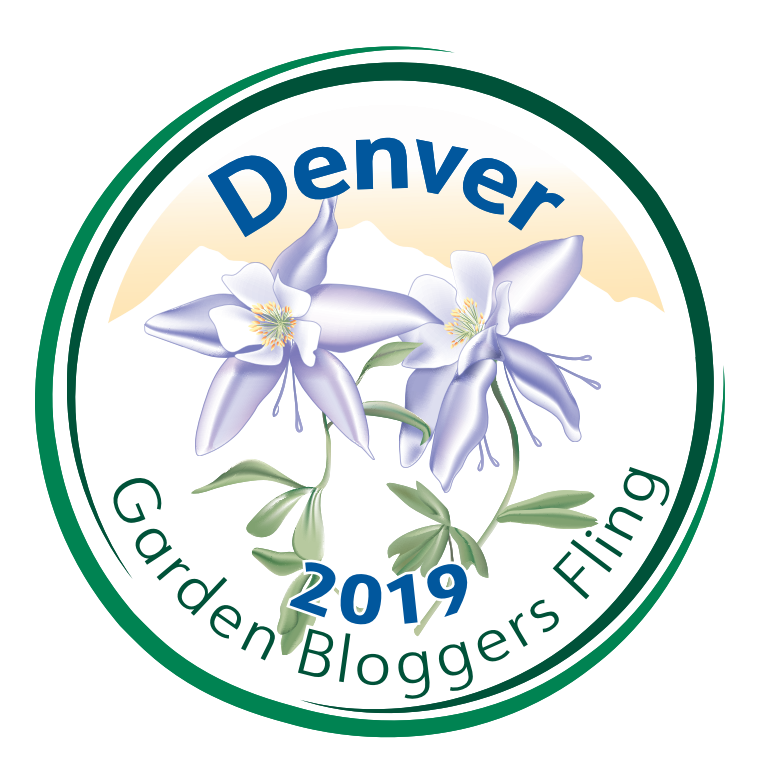 I believe this is the 8th annual Garden Blogger Fling and it is very much about sharing gardens with other garden lovers as anything else. 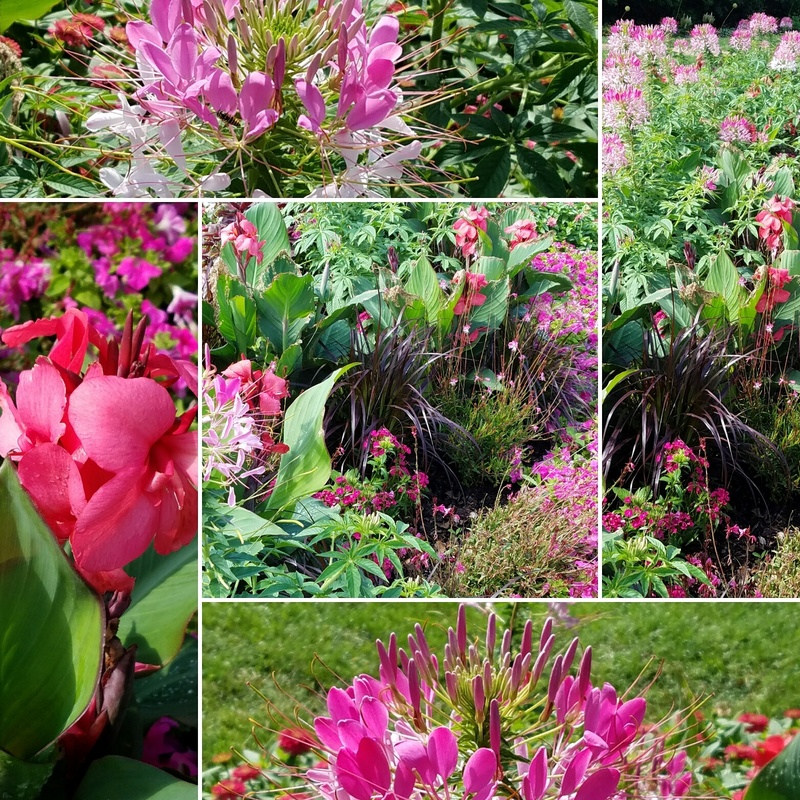 Here is where I got the idea of doing photo collages at each garden. This left more time for just enjoying the beauty of each place. The borders were stunning in all their various shades of pink. Can you believe it isn’t even lunch time yet! 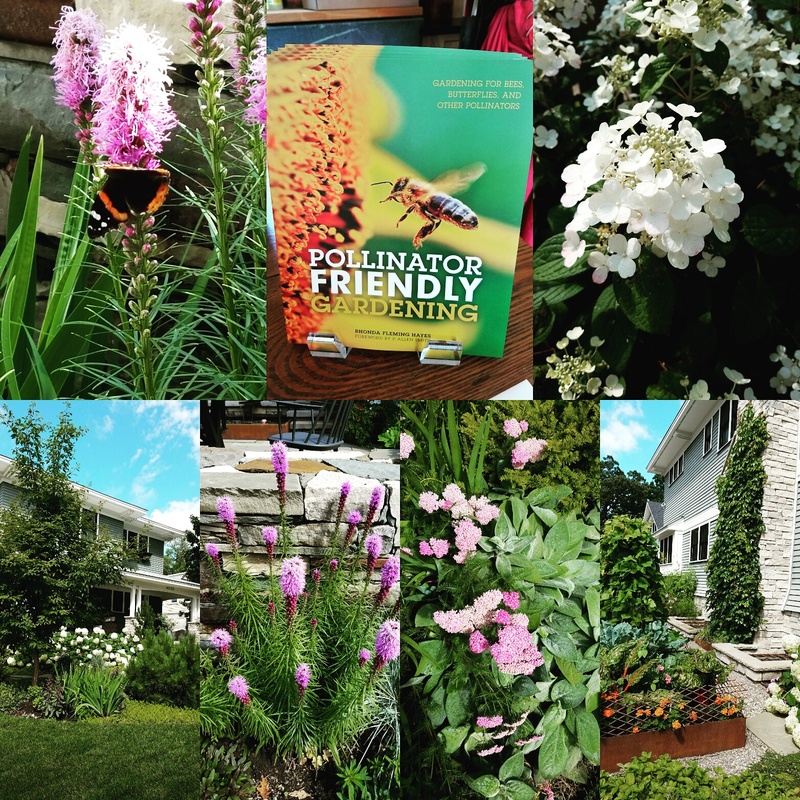 Our next stop is the garden of a fellow blogger Rhonda Fleming Hayes and the author of the book: Pollinator Friendly Gardening: Gardening for Bees, Butterflies, and Other Pollinators. 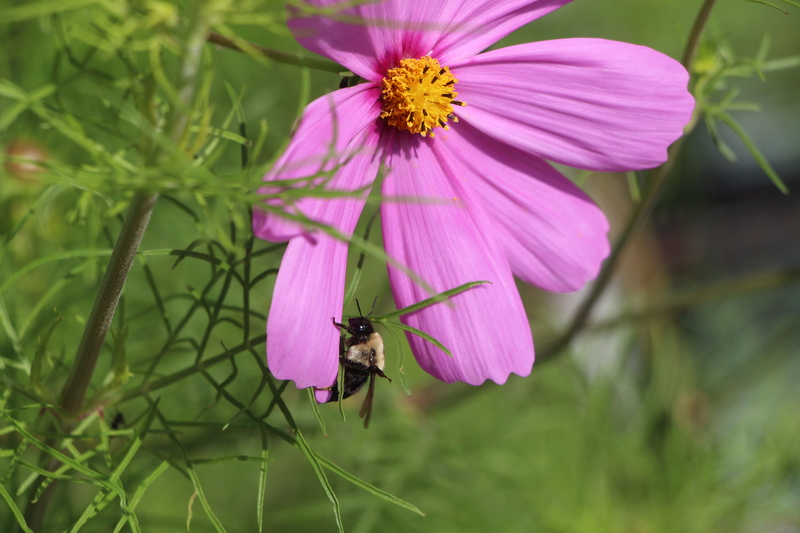 Her garden surrounding her suburban home has great lines, edibles and lots of buzzing! One of the fun things about Instagram is the hashtag. People can follow certain words of phrases. 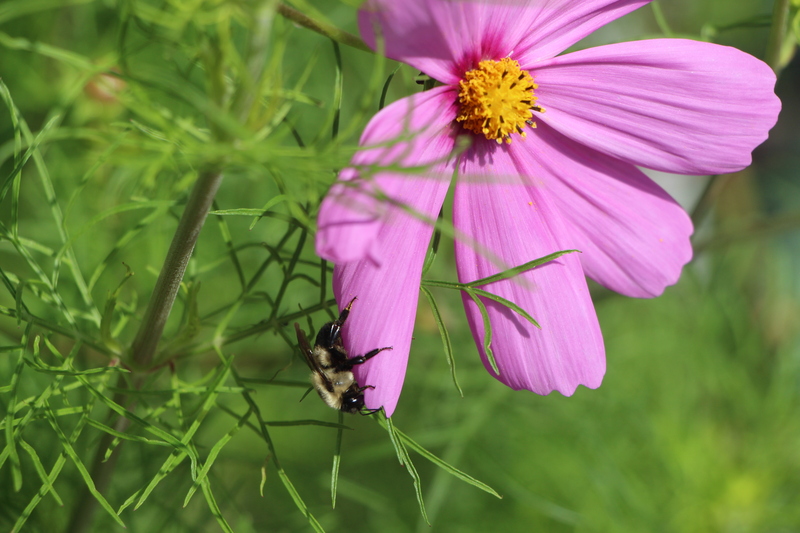 The bloggers were challenged to add the hashtag #FeedABee to their Instagram post. 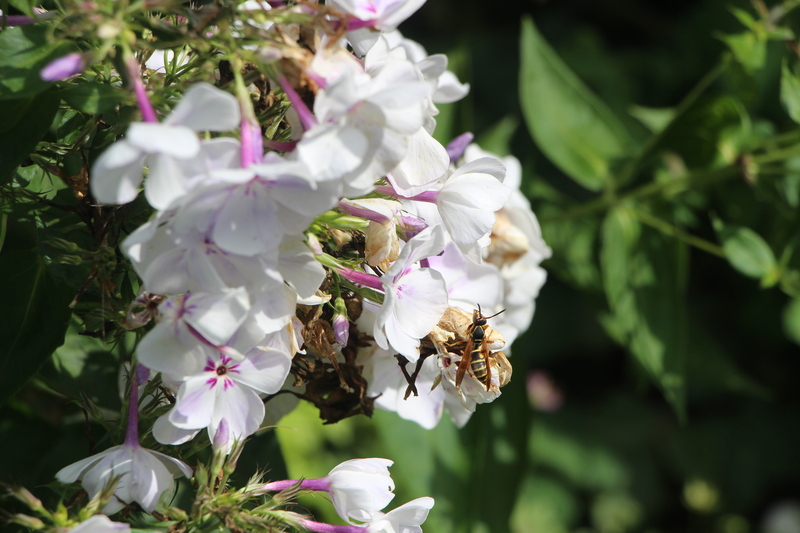 Here are some cool bee shots Shawn took. Going up, going down! We were treated to lunch and a tour at Bachman’s flagship store in Edina. 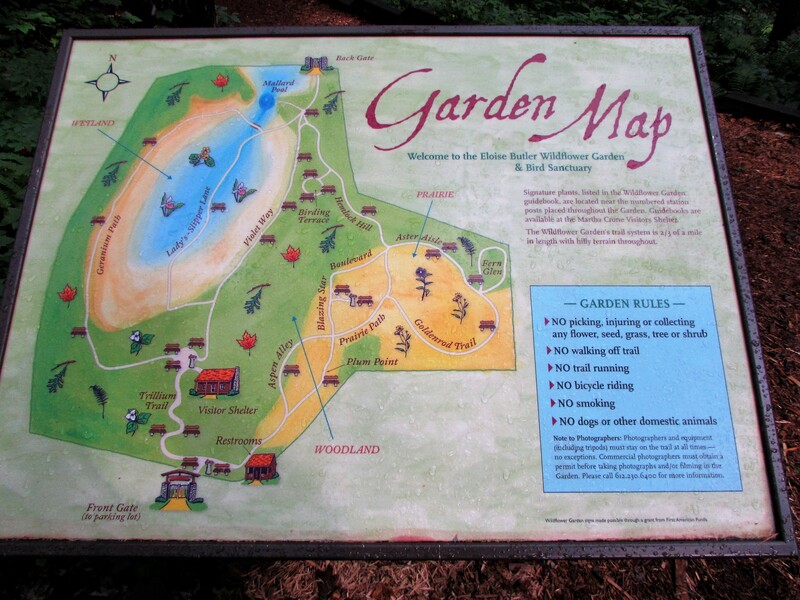 It is one of the oldest garden centers in the Twin Cities, known for their three-times a year makeovers of the old Bachman’s homestead into an “idea house.” I guess we must have been hungry because neither one of us took photos there! After lunch we headed to what the neighbors call “Latham Park”. It is the home of Dianne and Dan Latham. This garden is truly a labor, with emphasis on the word labor, of love. 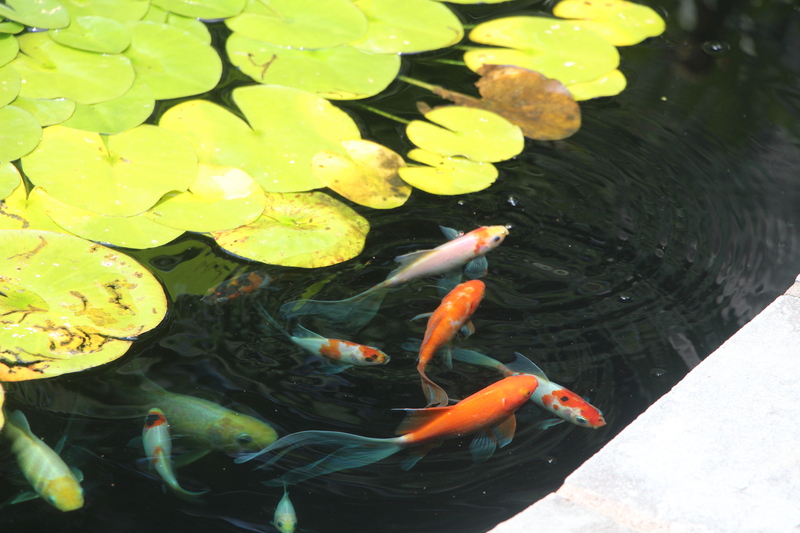 They work hard and even bringing many of the plants, along with the goldfish inside to winter. 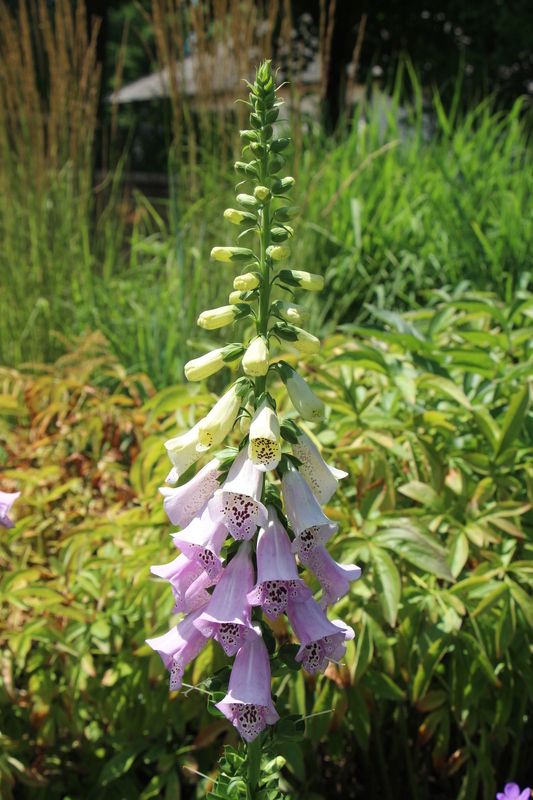 They have so many different kinds of plants, shrubs and trees it is a real visual treat. The gazebo and pond make a inviting destination to sit and enjoy the garden. Diane said to us that Dan tries to sit and enjoy but she usually has another task for him : ) . 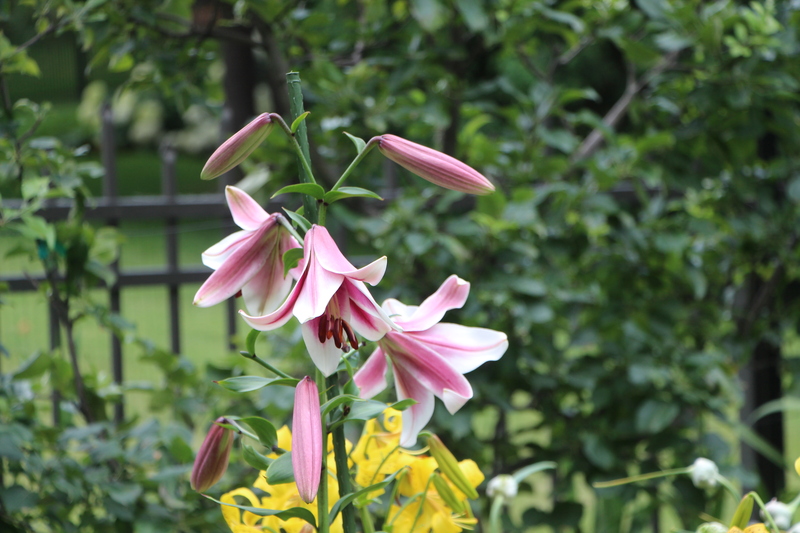 Dianne is an active member of the North Star Lily Society. She had so many lovely lilies. 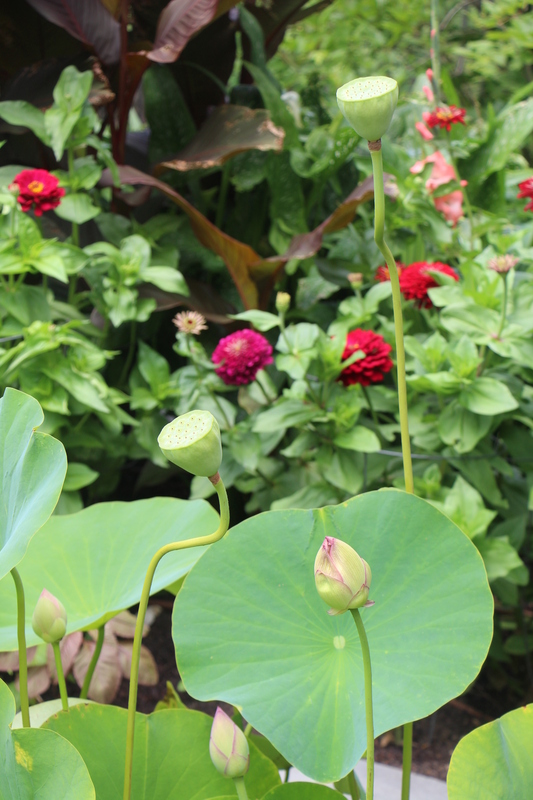 My favorite was the fish pond with its lotus flowers and seed heads. Each year they bring the fish in for the winter and come spring they have more than they started with and have to find them homes with schools and others with ponds. 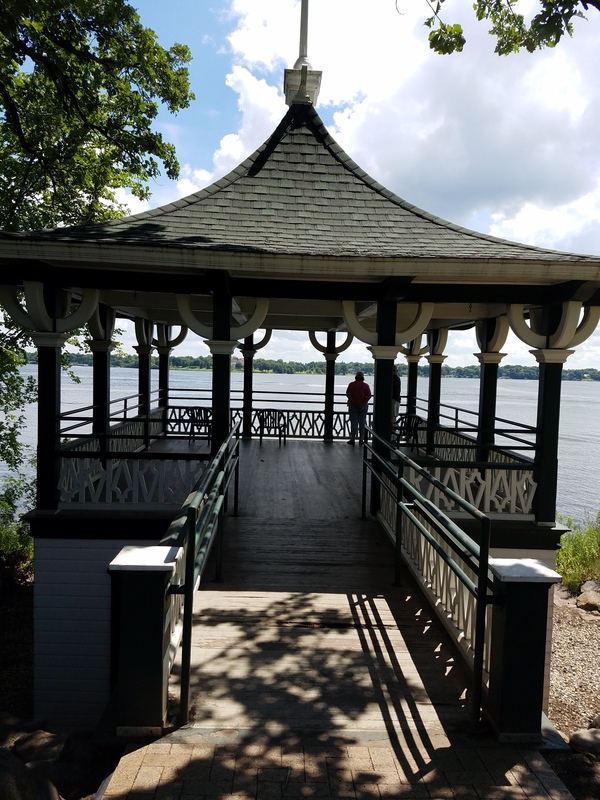 The mid-afternoon found is a the beautiful Noerenberg Memorial Gardens on the edge of the tranquil Crystal Bay on Lake Minnetonka. The home was torn down on the estate of Frederick Noerenberg, the founder of Grain Belt Beer. His daughter Lora Noerenberg Hoppe, one of his 5 children, was the chief horticulturist of the gardens for a number of years. She bequeathed the estate to the Three Rivers Park District in 1972. She asked that the family home be demolished and that the estate be kept as a public garden for all to enjoy. The garden design and plantings were influenced by the estate gardens of England. We had more time at this garden and I had the pleasure of having a nice chat with Jim of Garden Design magazine while enjoying the lovely view of the water. Our final tour of day 1 was the nursery and private home of Steve Kelley and Arla Carmichiel. 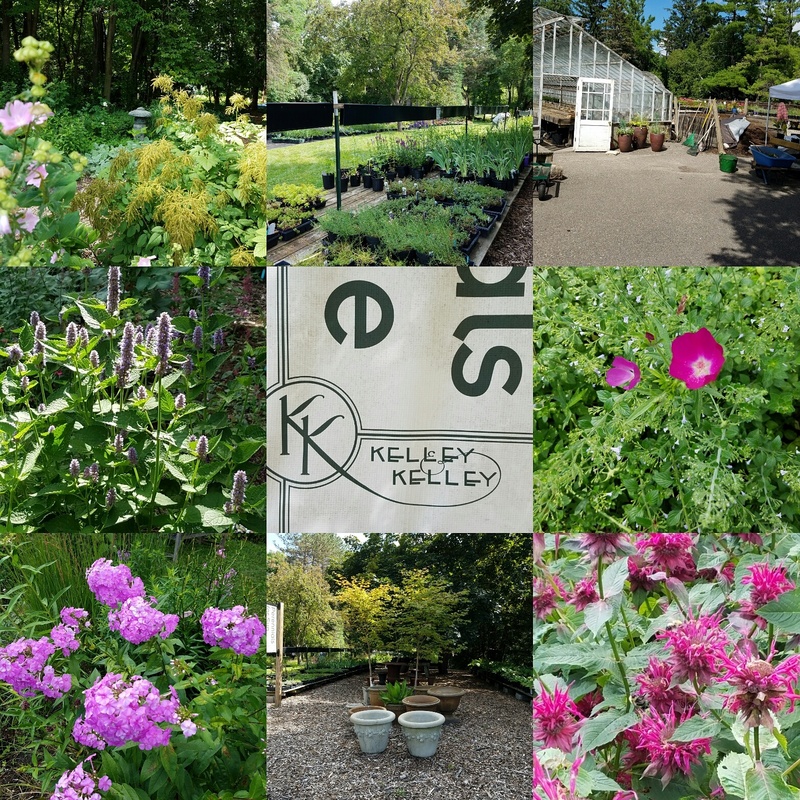 Our itinerary tells us that Arla Charmichiel is the horticulturist at Noerenberg Gardens which we had just left and her husband, Steve, owns Kelley and Kelley Nursery. Their home is literally across the street and just a short drive from the Noerenberg Gardens. Steve is known for the thoughtful essays that appear in his nursery’s catalog each year. 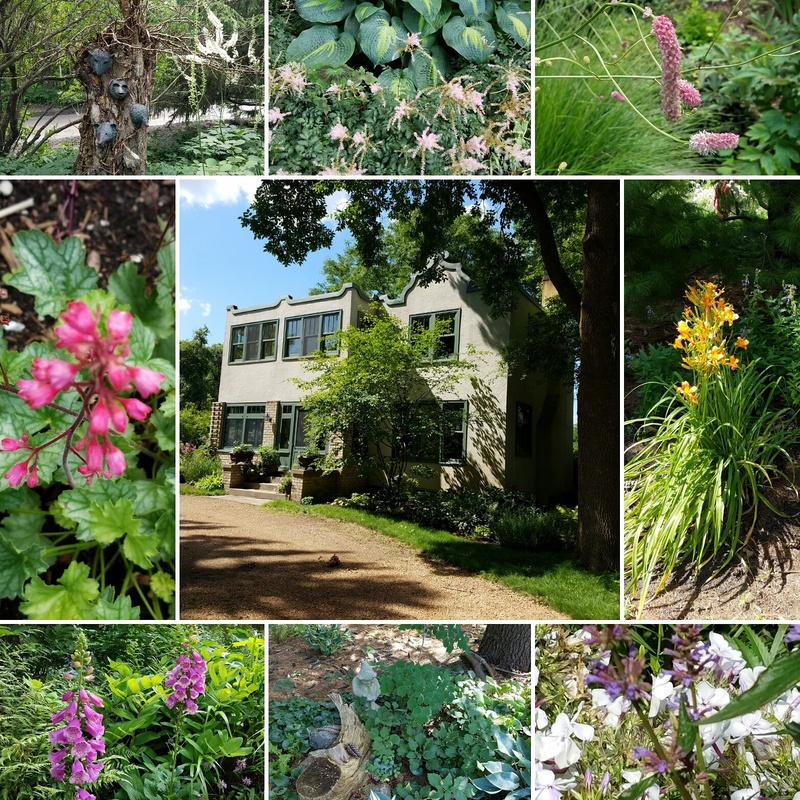 I love the architecture of this home and the garden was rambling and full of so many different plants and pollinators. By now we were replete and winding down. Along the paths you would come across gnomes and other delightful garden art. My favorite was this tree. 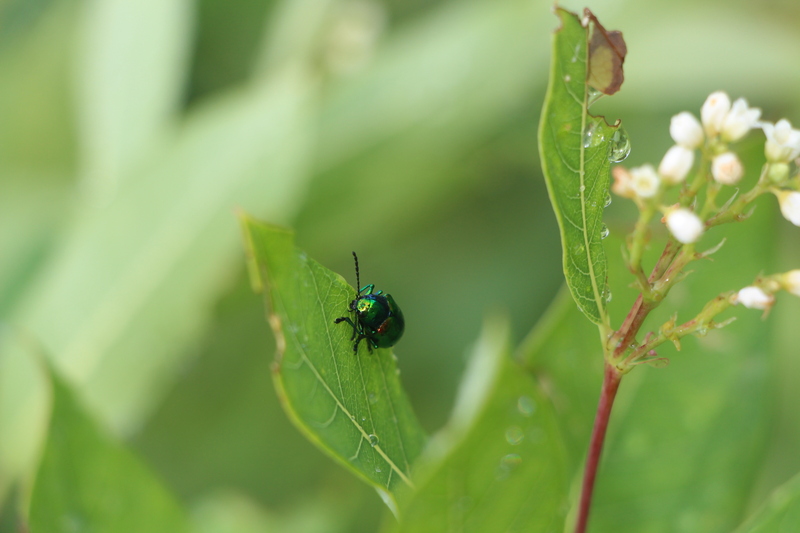 Shawn found some interesting insects to shoot too! Butterflies! Wasps! Around 5ish the buses headed back to the hotel with enough time to relax and clean up before heading a delicious Happy Hour…well couple of hours….hosted by on of our sponsors Garden Design Magazine. It was so fabulous we didn’t need to find dinner. Thank you Jim and GD. (Below is Jim is on the left in the light colored shirt) I will try not to take too long to get up day 2. Summer is quiet here in Houston and I have more free time and little desire to go outside. The Minneapolis Fling was definitely action packed, for three whole days. Nice summary of Day One. It was good to see you both again. Thanks Helen, it was fun to see everyone and the gardens were wonderful! Wonderful wrap up of the 1st day – I smiled when I saw that button bush photo as I have a very similar pic. I was hoping to get to a fling post last week, but it was just so busy. Our summers are high season for getting thing done in and around the garden – so many things to write about yet so little time to write them! That was a delicious happy hour buffet, wasn’t it? Excellent round up of the first day of the fling. 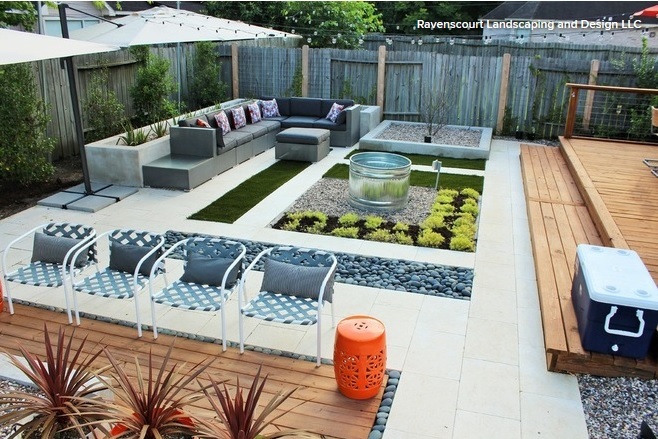 I was very impressed by the Rhonda Hayes garden, amohg others. Thank you, It was great sharing it with you and Judy! 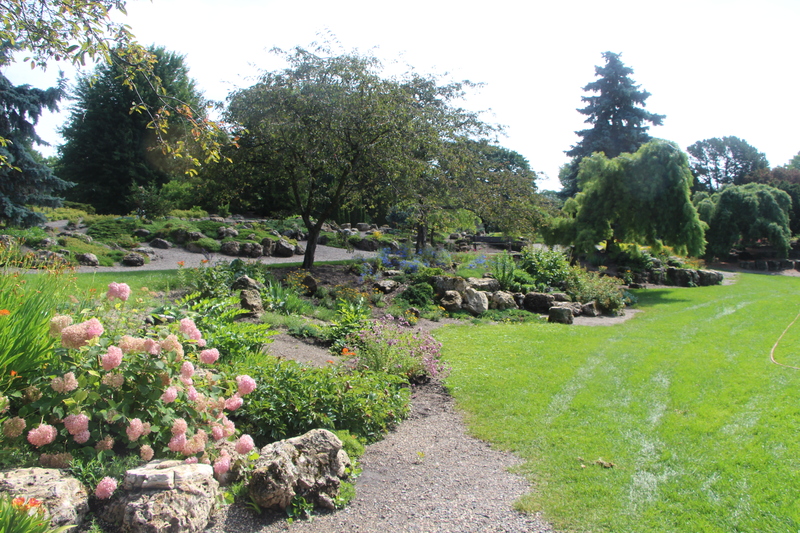 Wow – you really had an amazing time – what a great collection of gardens to be able to visit. I’m starting to think my life’s priorities are all wrong.